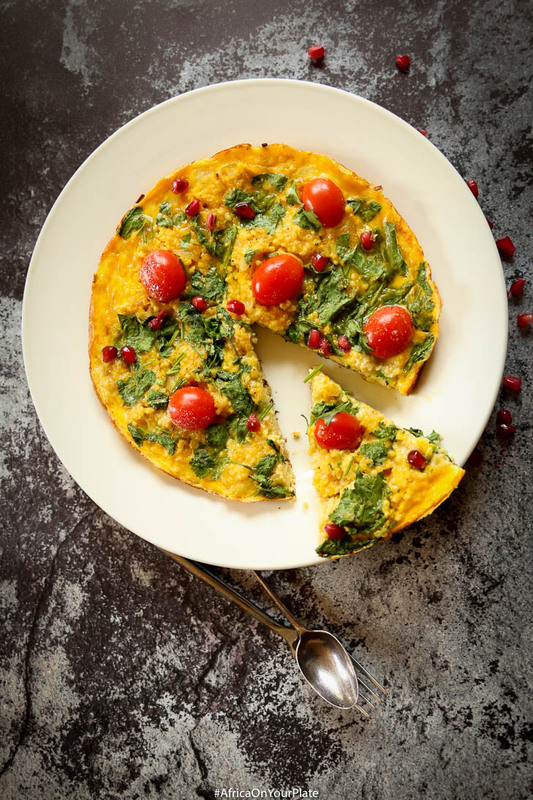 This Millet and Pomegranate Frittata is now part of my Sunday morning breakfast routine. There’s something divine about tucking into a sweet and savoury plate, and a mug of steaming tea, while golden rays of the morning sunshine gently warm the skin and the soft tunes of Van Morrison’s Brown-Eyed girl play quietly in the background. Aargh…scrap that bit about Van Morrison and replace that with two screaming and kicking kids in the background. The two whom I have vowed, as part of my healthy eating objective, to feed more eggs this year. So I am a woman on a mission, and this dish is just perfection. 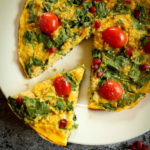 The first time I made it, I was just looking for an egg dish that hinted of the promise of hidden eggs (since my 7-year old has an imagined aversion to egg yolks). I had some millet in the pantry and decided to give this a go. A few minutes, and an empty skillet later, I knew I had struck gold. 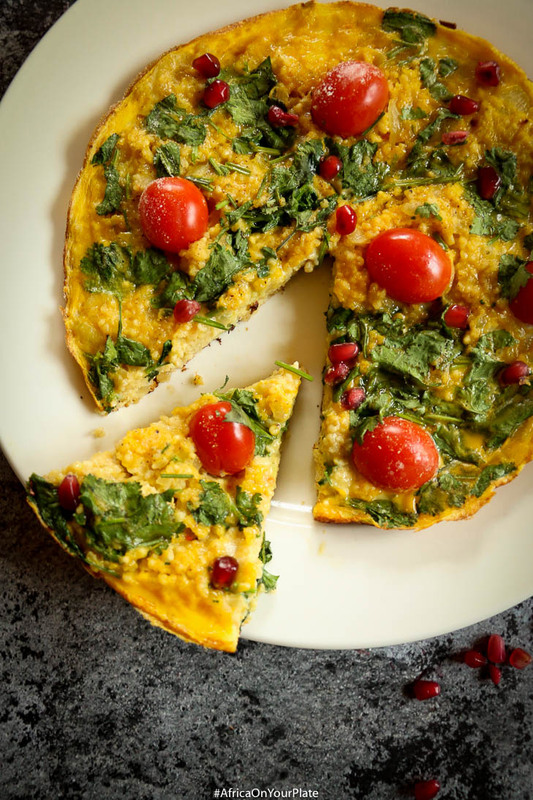 A week later, when the kids requested millet frittata for breakfast, I doubled-up on the portions. And what a way to start the day. 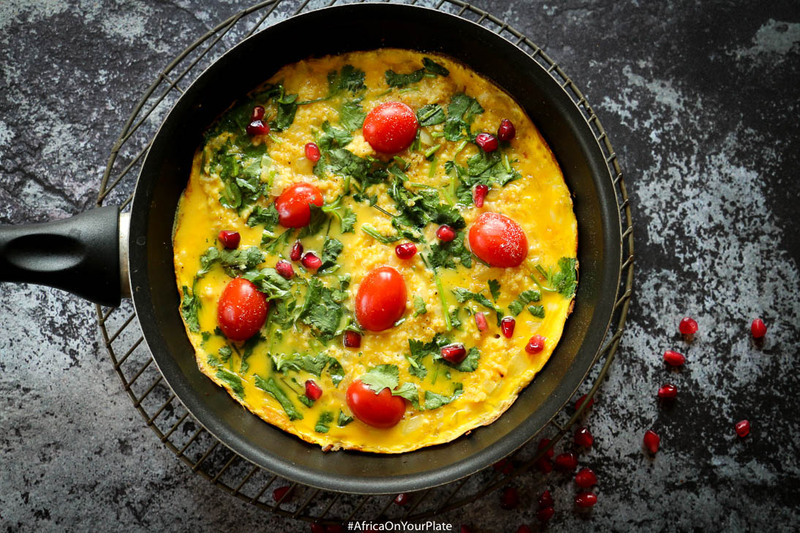 Fibre-rich and gluten-free millet just keeps you feeling full for longer, while the eggs are loaded with protein and omega-3 fatty acids- This is the perfect combo for breakfast. Deceptively easy to make, all you need do is steam your millet till soft, then simply whisk your ingredients together and cook on low to medium heat. It really is that simple! 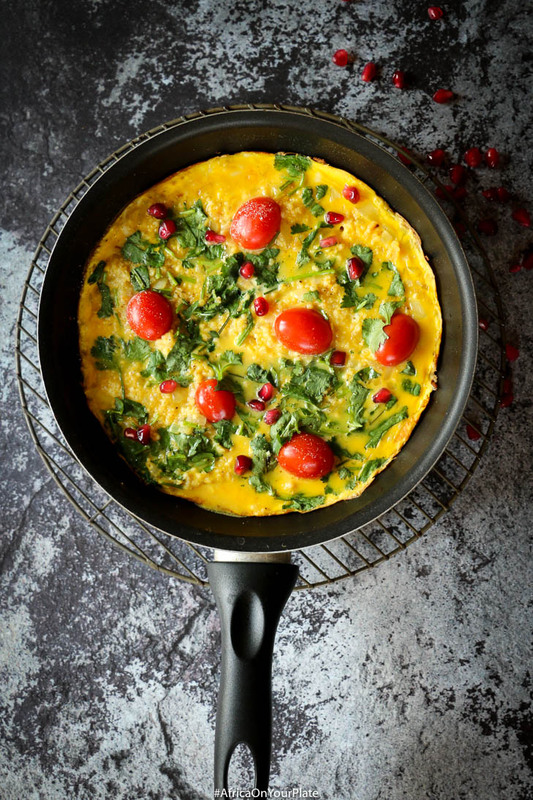 To turn up the anti-oxidant dial, I’ve pimped my frittata with cherry tomatoes for my daily dose of lycopene, and pomegranates for that age-defying Vitamin C. I’ve also added a bit of gruyère cheese for that salty, earthy flavour which you know by now, is something I can’t get enough of. Heat an empty pan, and when hot, add the millet and stir constantly to coax out the nutty flavours. This should take about 5 minutes for the millet to turn slightly brown and nutty. Add 150ml of boiling water, and half a stock cube. Cover the pan tightly, and reduce the heat to medium. Cook for 10 minutes. After 10 minutes, transfer the pan from the heat. Leave covered for another 10 minutes so the millet continues to cook in its steam. Add the milk to the eggs and whisk together. Heat a skillet on medium heat, and when hot, add 1 tbsp of olive oil. Add the onions and garlic and fry until soft and golden. Add the millet and strips of cheese. Cook until the cheese is completely melted. Add the whisked egg and milk, cilantro, and cherry tomatoes. Reduce the heat to low and cook for 10 - 15 minutes until the egg is completely set. 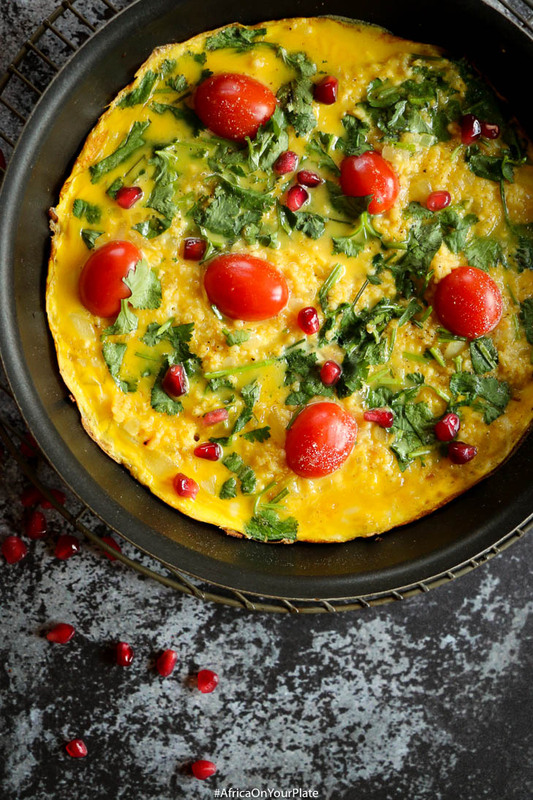 Top the frittata with pomegranate seeds and serve. You’ve got nothing to lose by trying this one out. You’ll thank me later…for sure! All I ask is that you hit me up on Instagram with #AfricaOnYourPlate so I can drool at your pictures with reckless abandon..